Systemic lupus erythematosus (SLE) is a prototypical autoimmune disease characterized by various systemic symptoms and multiple organ damage. We clarify biological and functional abnormalities in SLE by comparing the gene expression profiles of SLE patients with those of healthy individuals. Gene expression profiles from the peripheral blood of 21 SLE patients and 45 healthy individuals were obtained using a DNA microarray. Gene ontology analysis and network pathway analysis were performed on the genes differentially expressed between SLE and healthy individuals. A total of 2,329 upregulated genes and 1,884 downregulated genes were differentially expressed. Gene ontology analysis revealed that the upregulated genes were classified as response to biotic stimulus genes, which mainly includes genes related to immune response. Abnormalities in other categories such as cell motility and regulation of apoptosis were also revealed. Downregulated genes were mainly sorted into two gene categories, sensory perception and response to radiation/light. The sensory perception genes included ATPase/ATPase domain-containing genes, myosin-related genes, and two excision repair cross-complementing genes, which are involved in DNA repair. Other genes in this group - including three crystallin genes, genes encoding the receptor protein for melanocyte-stimulating hormone, and six mitochondrial-DNA encoded genes, which are involved in ATP synthesis - were also categorized as response to radiation genes. 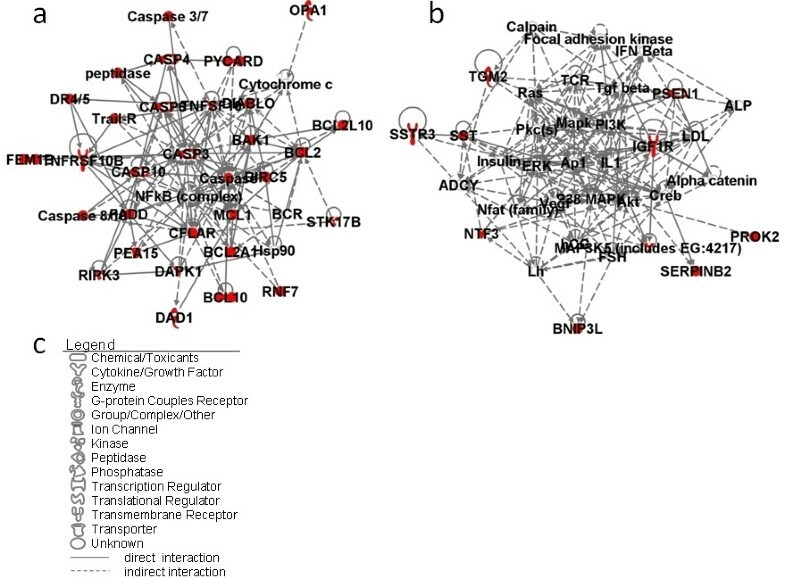 Using network pathway analysis, IL-6, transforming growth factor beta 1, TNF, and hepatocyte nuclear factor 4α were found to play central roles in the networks of sensory perception-related molecules. Functional abnormalities in ATP synthesis and DNA repair are implicated in peripheral blood cells from SLE patients. Systemic lupus erythematosus (SLE) is a prototypical autoimmune disease characterized by various clinical manifestations, high titers of autoantibodies, and multiple organ damage . Multiple genetic and environmental factors are thought to influence the disease progress, but details of the mechanisms of SLE clinical manifestations or the biological processes behind them remain obscure. The role of environmental factors pathologically involved in SLE, especially regarding skin lesions after sun exposure, has been reported . In addition, abnormalities in apoptosis, impaired clearance of dying cells, hyper-reactive B cells and T cells in the immune system, and many other SLE pathophysiologies have also been investigated [3, 4]. From an autoimmunologic viewpoint, disruption of self-tolerance is implicated through distortion in the cell-cell communications and cytokine networks. Nevertheless, there are few reports comprehensively considering the environmental factors in combination with aberrant biological or cellular functions in SLE, which involve a substantial number of molecules. DNA microarrays can be amenable to exhaustively analyze the gene expressions of such multiple molecules. Indeed, Bennett and colleagues have demonstrated using a microarray that type I interferon and its related molecules as well as granulopoiesis-related molecules play central roles in SLE . We and other researchers, also using microarray analysis, confirmed the interferon signature in peripheral blood cells from patients with SLE [6–8], where IFNα, IFNβ, and TNF may interact with each other in regulating the immune response molecules [8, 9]. Despite these important findings in immune response, because SLE is a systemic disease that influences multiple organs, it is also important to clarify other biological or cellular functional abnormalities relevant to SLE clinical manifestations other than immunological response abnormality. In the present study, we attempt to identify such abnormalities using differentially expressed genes exhaustively analyzed by DNA microarray together with bioinformatics analysis. Twenty-one patients (all women, median age 35 years, range 26 to 72 years) with SLE according to the diagnostic criteria of the American College of Rheumatology  and 45 healthy individuals (23 males, 22 females) were enrolled in the present study after providing written informed consent. The study was approved by the Ethical Committee of Wakayama Medical University for clinical studies on human subjects. Twenty SLE patients were treated with prednisolone <20 mg/day, and the remaining one patient at 20 mg/day. Three of these 21 patients were treated with cyclosporine, with azathioprine, or with methotrexate in combination with prednisolone, respectively. The median disease activity of SLE patients based on the SLE Disease Activity Index (SLEDAI) 2000 score was 6 (range 2 to 24) . One patient was in a very active state (SLEDAI 2000 score >12), 17 patients were in active states (SLEDAI 2000 score = 4 to 12), and the remaining three patients were not active (SLEDAI 2000 score <4). The median of the assessment based on the BILAG index was 3 (range 1 to 13) . Meanwhile, the median of total white blood cells from SLE patients was 6,150/mm3 (range 2,900 to 12,230/mm3). The median for the total number of and the proportion of neutrophils was 4,928/mm3 and 80.0%, respectively (range 1,601 to 9,674/mm3 and 55.2 to 90.1%), while that for lymphocytes was 919/mm3 and 14.7%, respectively (range 376 to 1517/mm3 and 4.7 to 24.5%). Peripheral blood was collected directly into PAXGene® tubes (Qiagen, Valencia, CA, USA). Total RNA was extracted using the PAXGene Blood RNA kit® (Qiagen) with optimal on-column DNase digestion. Amino allyl RNA (aRNA) was synthesized from 1 μg total RNA using the Amino Allyl MessageAmp™ aRNA kit (Ambion, Austin, TX, USA). Five micrograms of aRNA from each sample (21 SLE patients and 45 healthy individuals) and the equivalent quantity of reference aRNA from a mixture of RNA extracted from peripheral blood of 45 healthy individuals were subjected to Cy3 and Cy5 labeling, respectively. Both labeled aRNA samples were mixed in equal amounts and hybridized with an oligonucleotide-based DNA microarray, AceGene® (HumanOligoChip30K; DNA Chip Research, Yokohama, Japan), which contained 30,000 human genes. The microarrays were scanned using ScanArray Lite® (PerkinElmer, Boston, MA, USA). Signal values were calculated using DNASIS Array® (Hitachi Software Engineering, Tokyo, Japan) according to the manufacturer's instructions. The intensities of no-probe spots were used as the background. The median and standard deviation of background levels were calculated. Genes whose intensities were less than the median plus two standard deviations of background level were identified as null. The Cy3/Cy5 ratios of all spots on the DNA microarray were normalized by the global ratio median. Only gene expression data that were collected from at least 80% of samples from each group were selected for further analysis. Microarray data have been deposited in the NCBI Gene Expression Omnibus [GEO:GSE17755]. Genes identified to be differentially expressed according to microarray analysis between SLE patients and healthy individuals were functionally categorized using Expression Analysis Systematic Explorer (EASE) version 2.0 bioinformatics software . Interactions among the molecules of which the genes were differentially expressed in their respective gene categories were investigated using Ingenuity Pathway Analysis version 8.0 . Networks generated by less than five uploaded genes were excluded from the analysis. The unpaired Mann-Whitney test was used to determine statistically significant differences in the mRNA expression levels between the SLE and healthy groups. Correlation was measured using Spearman's rank correlation. The criterion for statistical significance was P < 0.05. DNA microarray analysis revealed that 4,213 genes were differentially expressed in peripheral blood cells from patients with SLE compared with healthy individuals: 2,329 out of the 4,213 genes were upregulated, while the remaining 1,884 genes were downregulated. Such a large number of the differentially expressed genes appeared to reflect the pathological complexity involving many molecules of this systemic disease with various clinical manifestations. To identify any aberrant biological functions in the peripheral blood cells of SLE patients, we performed EASE analysis based on the Gene Ontology database, which can classify a large list of genes into functionally related gene groups and rank the importance of these functional groups on the differentially expressed genes. EASE analysis classifies the gene groups into three Gene Ontology systems: biological process, cellular component, and molecular function. EASE results for the biological process system for upregulated and downregulated genes are shown in Tables 1 and 2, respectively. The EASE score, which is a modified Fisher exact test, represents the probability that over-representation of a certain gene category occurs by chance. Based on common genes, gene categories were further divided into subsets. Each subset of the gene categories was then ordered hierarchically based on the gene list. Identical gene lists are listed as one gene category. The list parameter refers to the total number of upregulated/downregulated genes annotated in the Gene Ontology system (data not shown). There were in total 1,759 genes in the list for 2,329 upregulated genes and 1,429 genes in the list for 1,884 downregulated genes. List hits represent the number of upregulated/downregulated genes that belong to the respective gene category. The population parameter reports all genes annotated in the Gene Ontology system (data not shown). The total number of genes in the population of the biological process system was 13,802. Population hits show the number of genes that belong to the respective gene category in the system. Deviated Gene Ontology database (GO) Biological Process gene categories of upregulated genes in peripheral blood of systemic lupus erythematosus (SLE) patients compared with healthy individuals. EASE, Expression Analysis Systematic Explorer software, version 2.0. Deviated Gene Ontology database (GO) Biological Process gene categories of downregulated genes in peripheral blood of systemic lupus erythematosus (SLE) patients compared with healthy individuals. EASE, Expression Analysis Systematic Explorer software, version 2.0. EASE analysis of the upregulated genes identified four major gene categories: response to external stimulus, cell growth and/or maintenance, cell motility, and regulation of apoptosis (Table 1). The top-three most-significant categories based on the EASE score - which include response to biotic stimulus, defense response, and immune response - were grouped into the response to external stimulus category and were arranged hierarchically. The gene category cell growth and/or maintenance included ubiquitin-dependent protein catabolism genes. Finally, 62 upregulated genes belonged to the category cell motility, in which 22 of the genes related to inflammatory response or antigen presentation (data not shown) while 42 upregulated genes were in the category regulation of apoptosis. On the other hand, EASE analysis of the downregulated genes identified four major gene categories: sensory perception, response to radiation, calcium ion transport, and macromolecule biosynthesis (Table 2). The sensory perception category included ATPase/ATPase domain-containing genes and two excision repair cross-complementing genes (ERCC2, ERCC5). Six mitochondrial DNA (mtDNA)-encoded genes - including ATP synthase 6 (ATP6), cytochrome c oxidase (COX)1, COX3, cytochrome b (CYTB), NADH dehydrogenase subunit (ND)1, and ND2 - three crystallin genes, and genes encoding the receptor protein for melanocyte-stimulating hormone (melanocortin 1 receptor) were grouped into both the sensory perception category and the response to radiation category. Except for melanocortin 1 receptor, the 36 genes in the response to radiation category were also in the response to light category. These results suggested the possible existence of abnormalities in the above categorized functions. Here, we focus on the 42 upregulated genes in the category regulation of apoptosis. In order to identify the relationship among these molecules and the centered molecules in the networks, a network-based analysis was conducted on these molecules. 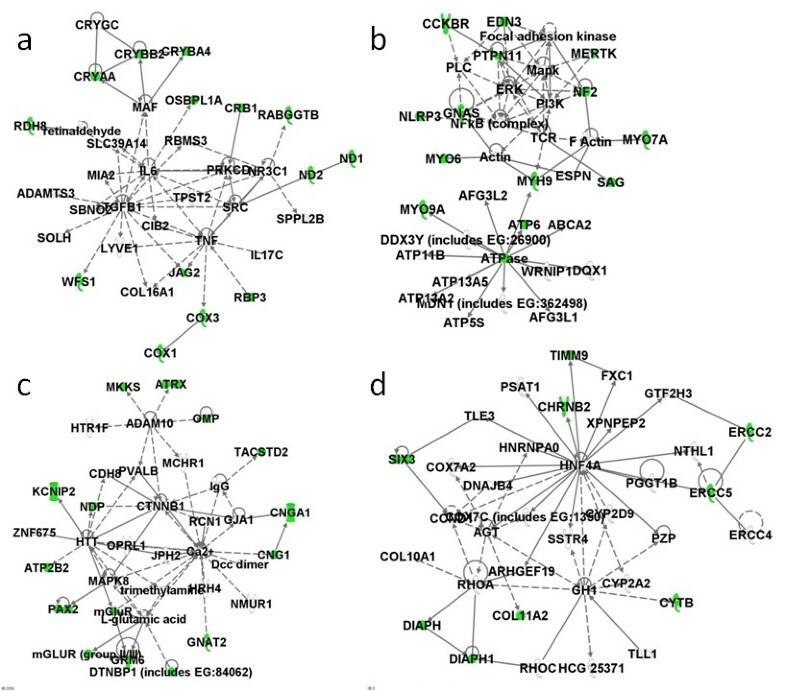 Two networks were represented by the 42 upregulated genes (Figure 1). Network pathway analysis of upregulated genes in the gene category regulation of apoptosis. (a) Network 1 and (b) Network 2 constructed by 42 upregulated genes. (c) Network graphical representation. Genes or gene products are represented as individual nodes whose shapes represent the functional class of the gene products. The biological relationship between the two nodes is represented as an edge (line). All edges are supported by at least one reference from the literature stored in the Ingenuity Pathways Knowledge Base (IPKB). Genes with colored nodes were found over-represented in the gene category regulation of apoptosis. Genes with uncolored nodes were not found over-represented, but were depicted by computationally generated networks on the basis of evidence stored in the IPKB, indicating strong biologic relevance to that network. Twenty-five of the 42 genes created the first network (Figure 1a) with the NF-κB complex and caspase complex at the center. Caspases, or cysteine-aspartic proteases, are a family of cysteine proteases that play essential roles in apoptosis, necrosis and inflammation. Caspase (CASP)3, CASP4, CASP6, and CASP10 genes are in this network. Also present in the first network are the CASP8 and FADD-like apoptosis regulator genes, the B-cell CLL/lymphoma 2 gene, and TNF superfamily-related genes, all of which are involved in the caspase cascade, and the optic atrophy1 (OPA1) gene. OPA1 is a component of the mitochondrial network and is involved in the positive regulation of anti-apoptosis. Meanwhile, many transcription factors such as p38 mitogen-activated protein kinase, extracellular signal-regulated kinase, Ap1, and Akt represent the center of the second network (Figure 1b). Presenilin1, which relates to mitochondrial dysfunction, is also depicted in this network. The downregulated genes categorized into sensory perception included ATPase/ATPase domain-containing genes, two ERCC genes (ERCC2 and ERCC5), as well as six mtDNA-encoded genes. Using network pathway analysis on the 56 genes in sensory perception, four networks were constructed (Figure 2). Network pathway analysis of downregulated genes in the gene category sensory perception. (a) Network 1, (b) Network 2, (c) Network 3, and (d) Network 4 constructed by 56 downregulated genes. A cluster of crystallin genes, COX1, COX3, ND1, and ND2 are represented in the first network, in which IL-6, transforming growth factor beta 1, and TNF are at the center (Figure 2a). The second network has extracellular signal-regulated kinase, NF-κB, and mitogen-activated protein kinase at the center (Figure 2b). The calcium ion plays central roles in the third network (Figure 2c), while hepatocyte nuclear factor 4α is important in the final network (Figure 2d). ERCC2, ERCC5, and CYTB were also found in the last network. The results also showed that, among the 56 downregulated molecules, there are six molecules involved in the pathways of oxidative phosphorylation (ATP6, COX1, COX3, CYTB, ND1, and ND2), in which three are relevant to mitochondrial dysfunction. Because the expressions of DNA repair and mtDNA-encoded genes were found downregulated, the relevant gene expression levels were further investigated. Besides the molecules mentioned above (ERCC2, ERCC5, CYTB, COX1, COX3, ND1, ND2, and ATP6), the expression levels of X-ray repair cross-complementing 6, COX2, and ATP8 were also decreased in patients with SLE (Figures 3 and 4). Several ATPases and ATP synthases such as ATP2B1, ATP2B2, ATP5D, ATP5S, ATP6V1H, ATP8A2, and ATP10B were also significantly downregulated (unpaired Mann-Whitney test, P < 0.01) (data not shown). Decrease in the expressions of three DNA repair genes. The expression levels of (a) excision repair cross-complementing (ERCC)2, (b) ERCC5, and (c) X-ray repair cross-complementing (XRCC)6 in peripheral blood of 21 patients with systemic lupus erythematosus (SLE) and 45 healthy individuals (HI) are shown. All data represent microarray data with the expression values of log2(sample/reference). *P < 0.05, **P < 0.01, ***P < 0.001 (unpaired Mann-Whitney test) for 21 SLE patients versus 45 HI. Boxes contain the 50% of values falling between the 25th and 75th percentiles, the horizontal line within the box represents the median value, and the whiskers are the lines that extended from the box to the highest and lowest values, excluding outliers. Decrease in the expressions of nine mitochondrial DNA-encoded genes. The expression levels of (a) cytochrome c oxidase (COX)1, (b) COX2, (c) COX3, (d) cytochrome b (CYTB), (e) NADH dehydrogenase subunit (ND)1, (f) ND2, (g) ATP synthase (ATP)6, and (h) ATP8 in peripheral blood of 21 patients with systemic lupus erythematosus (SLE) and 45 healthy individuals (HI) are shown. All data represent microarray data with the expression values of log2(sample/reference). *P < 0.05, **P < 0.01, ***P < 0.001 (unpaired Mann-Whitney test) for 21 SLE patients versus 45 HI. Boxes contain the 50% of values falling between the 25th and 75th percentiles, the horizontal line within the box represents the median value, and the whiskers are the lines that extended from the box to the highest and lowest values, excluding outliers. On the other hand, among the 21 SLE patients eight had a history for manifestations of photosensitivity. 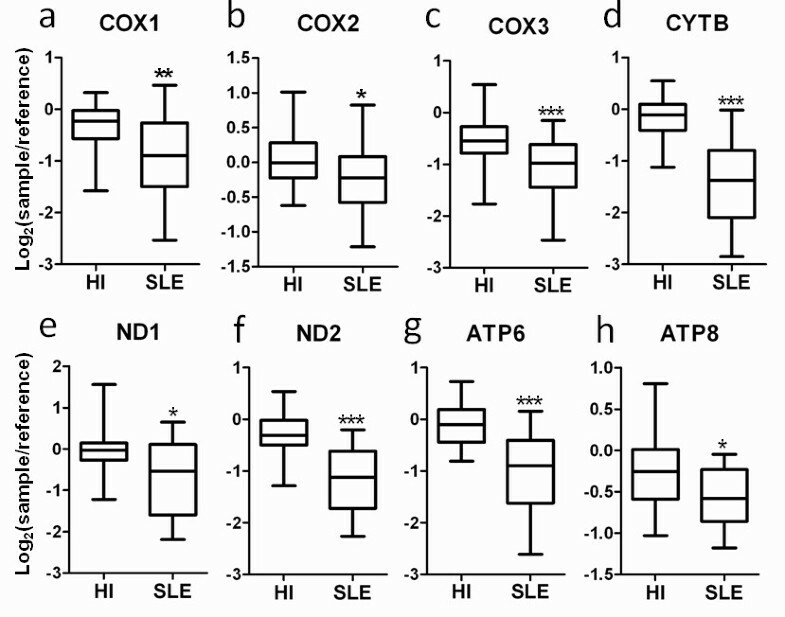 Among the 11 molecules identified in Figures 3 and 4, only X-ray repair cross-complementing 6 expressions correlated with the SLEDAI from the eight patients. Meanwhile, we found only ND1 and ND2 expressions correlated with the SLEDAI of all 21 SLE patients (data not shown). These results may in part be due to the small range of gene expression-level data gathered from the AceGene® microarray and the small variability in SLEDAI of the patients recruited in the present study. In the present study, we compared the gene expression profiles of 21 SLE patients (all females) with those of 45 healthy controls consisting of 23 males and 22 females. Since all SLE patients are female, we also limited our comparison to the gene expression profiles of the 21 SLE patients with the 22 female controls only, finding no changes to our conclusions. We include the 23 males so that we can use the same control group for later studies when comparing other disease controls. We and other researchers have reported that NF-κB signaling pathways play significant roles in the aberrant immunoregulatory networks of SLE and other autoimmune disorders [8, 15, 16]. NF-κB is a key transcription factor that regulates the expression of a wide range of genes, including those involved in immune response, cell adhesion, differentiation, proliferation, and apoptosis. Notably, Oikonomidou and colleagues demonstrated that impaired NF-κB signaling observed in SLE patients can be partially explained by a decrease in NF-κB binding to DNA . In the present study, we found aberrant expression of the genes relevant to the categories regulation of apoptosis and response to light. Since the NF-κB complex was depicted in the center of these genes by network pathway analysis, NF-κB has again been thought to play a pathological role in regulating apoptosis and response to light. ERCC2, also called xeroderma pigmentosum complementation group D (XPD), encodes a protein involved in transcription-coupled nucleotide excision repair. Defects in the ERCC2 gene can result in three different disorders: the cancer-prone XPD syndrome, trichothiodystrophy, and aging disorders Cockayne syndrome, which is characterized by severe growth defects, mental retardation, and cachexia [18, 19]. ERCC2 is also a part of human transcriptional initiation factor TFIIH and has ATP-dependent helicase activity. ERCC5, also called xeroderma pigmentosum complementation group G (XPG), also encodes a DNA repair protein. ERCC5 is involved in excision repair of UV-induced DNA damage. Mutations of this gene cause XPG syndrome or Cockayne syndrome. Worth noting is the fact that the ERCC2/XPD and ERCC5/XPG proteins are both involved in excision repair of UV-induced DNA damage and that photosensitivity is commonly observed in patients with xeroderma pigmentosum, Cockayne syndrome, and trichothiodystrophy. Since enhanced photosensitivity is also a common clinical symptom for SLE, an abnormal expression of ERCC2/XPD and ERCC5/XPG may be pathologically involved in photosensitivity of SLE. An analysis of ERCC2/XPD polymorphisms in patients with SLE showed that these had no association with genetic susceptibility in SLE . Bassi and colleagues, however, reported that SLE leucocytes less efficiently repair radiation-induced DNA damage and that DNA repair gene polymorphic sites may predispose to the development of particular clinical and laboratory features such as neuropsychiatric manifestations and antiphospholipid antibody syndrome, although a significant association was not observed in SLE patients . 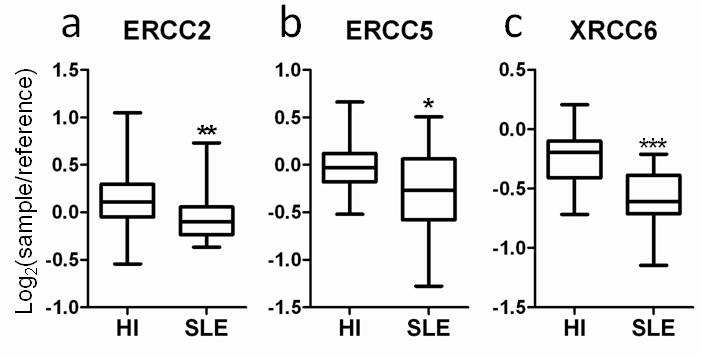 Here we found ERCC genes in the peripheral blood cells of SLE patients to be underexpressed. It is important to confirm the gene expression levels of DNA repair genes in skin, as skin is the outer surface organ that directly comes into contact with the environment, as is the case for sun exposure. Although the detailed biological characteristics of photosensitivity are still unknown, it is possible that UV light induces the accumulation of damaged DNA due to decrease in ERCC expression. As a result, abnormal apoptosis can occur, which results in poor disposal of cell debris including DNA. This in turn can lead to an overexpression of interferons by antigen-presenting cells, including plasmacytoid dendritic cells, which ultimately can lead to SLE systemic symptoms. ERCCs are also involved in the transcription-coupled repair of oxidative DNA lesions. A decrease in ERCC expression may thus contribute the susceptibility to oxidative stress in SLE. Abnormalities in the mitochondria have been a topic of interest for SLE studies for several years . It has been reported that lupus T cells exhibit mitochondrial hyperpolarization, resulting in ATP depletion, and thus contribute to abnormal T-cell activation and cell death in patients with SLE . We report that certain gene groups related to the function of sensory perception are underexpressed in the peripheral blood cells of SLE patients. Notably, of the relevant genes, six are mtDNA-encoded genes (ATP6, COX1, COX3, CYTB, ND1, and ND2) that also function in oxidative phosphorylation, where defects in three of them (COX1, COX3, and CYTB) also lead to mitochondrial dysfunction. Also worth noting is that repairs of UV-induced DNA damage by ERCC2/XPD and ERCC5/XPG requires ATP. The ATP and DNA binding regions are contained in ERCC2/XPD . Most amino-acid substitution variants of ERCC2/XPD found in patients with xeroderma pigmentosum, Cockayne syndrome, and trichothiodystrophy occur in these regions. 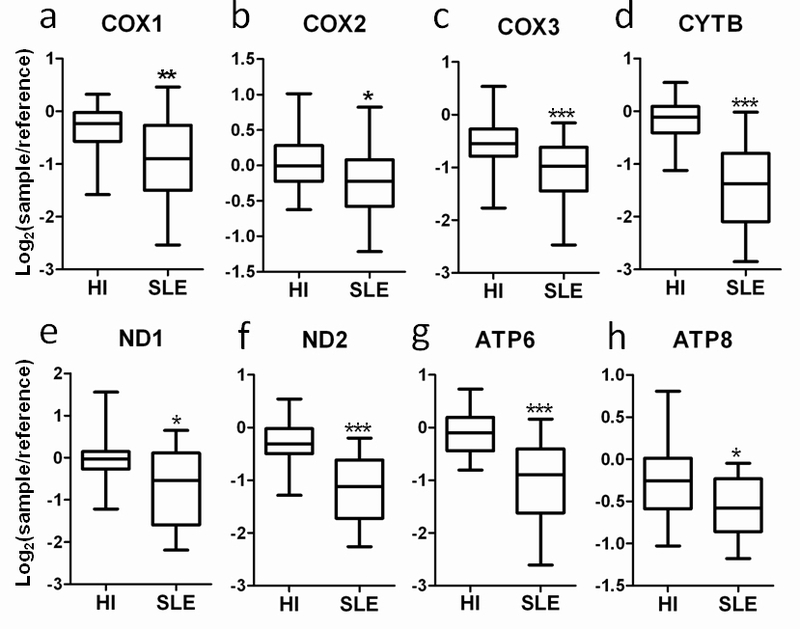 Although the reports mentioned above found no genetic variations in ERCC2/XPD or ERCC5/XPG when they were linked to SLE, the observed mitochondrial dysfunction in SLE, which implicates ATP depletion [20, 21], combined with the underexpression of ATP-dependent ERCC genes suggests impaired DNA repair or consequently increased apoptosis, both of which may contribute the clinical or laboratory manifestations of SLE. Moreover, OPA1 and nuclear respiratory factor 1 expressions were found to increase (data not shown). OPA1 is necessary for the synthesis of new mitochondrial components, while nuclear respiratory factor 1 functions as a transcription factor that activates the expression of certain nuclear genes required for mtDNA transcription and replication [25, 26]. Perl's group has added that persistent mitochondrial hyperpolarization is associated with increased mitochondrial biogenesis in SLE T cells , although the molecules above were not mentioned in their study. The increase in OPA1 and nuclear respiratory factor 1 expressions may compensate for the mitochondrial dysfunction seen in SLE. In our previous study in systemic juvenile idiopathic arthritis, we showed abnormal downregulation of genes related to oxidative phosphorylation, suggesting a mitochondrial disorder . It is interesting that we also identified downregulation of mtDNA-encoded genes involved in oxidative phosphorylation in the present study. Slight downregulation of ERCC2 expression was also observed in systemic juvenile idiopathic arthritis. We did not, however, identify other abnormal expressions of ERCC genes or oxidative phosphorylation-related genes in rheumatoid arthritis or polyarticular type juvenile idiopathic arthritis, although a downregulation of the gene expressions for ATP6 and CYTB were found in rheumatoid arthritis (unpublished data). Moreover, it is interesting that proinflammatory cytokines such as IL-6 and TNF, as well as anti-inflammatory cytokines including transforming growth factor beta, were found to play central roles in the networks of sensory perception molecules, which included oxidative phosphorylation-related molecules. The roles of cytokines in the immunoregulatory network of autoimmune diseases as well as the relationship of mitochondria with apoptosis have been previously reported, while few studies have described the relationships between cytokines and mitochondria [29–33]. These reports suggested that we cannot eliminate the possibility that chronic inflammation with imbalanced cytokine homeostasis may alter mitochondrial function. Functional abnormalities of ATP synthesis and DNA repair were implicated in peripheral blood cells from patients with SLE, but more investigation needs to be conducted to further elucidate the mechanisms involved in SLE. xeroderma pigmentosum complementation group G.
The authors would like to thank Dr Peter Karagiannis and Dr Takaji Matsutani for advice on preparing the manuscript. They also thank the general practices and patients who participated in the study, and Ms Ozawa for excellent secretarial support. The present work was supported by grants from the Ministry of Health, Labor and Welfare of Japan. H-ML performed the statistical analysis and interpretation of the microarray studies, and was involved in drafting the manuscript or revising it critically for important intellectual content. HS assisted with data analysis. CA performed labeling and scanning of the microarrays. NN made substantial contributions to the conception and design or analysis and interpretation of data. All authors read and approved the final manuscript.